Potain self-erecting cranes are split into four categories, based on their lifting capacity : Igo, Igo-M, Igo-T and GTMR. Their lifting capacity goes from 1.3 to 10 tons, with a height between 16 and 37 meters, depending on the model. This demonstrates once again the innovative engineering and modularity of the Potain brand and products. Choosing the Potain self-erecting cranes means choosing an exceptionally reliable lifting equipment with ease of set-up, modularity and quick disassembly. The new range by Potain ensures maximum reach for class-leading performance, more compact than its predecessor and innovative movement technology enables unfolding in narrow and compact areas. 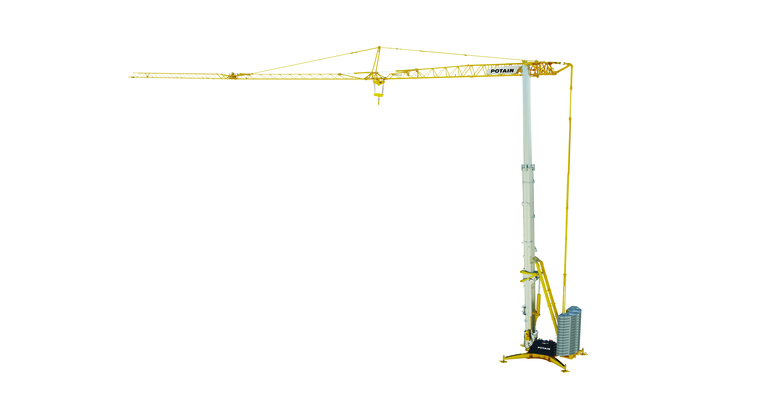 Igo self-erecting cranes are solid, easy to erect and use, and have several transport options. Wireless remote controls, silent and proficient electric motors, state-of-the-art changeable frequency motor drives, and overload protection systems are the norm. Simple and quick, the IgoM cranes are transported in a single trailer train which reduces time for erection. The newest range of Potain self-erecting cranes, the Igo T, offers a variable height for mast and jib with impressive load chart capabilities. The flagship IGO T 130 is one of the largest self erecting cranes in the world. GTMR cranes provide fast erection and high hoisting capabilities. They can be adapted to any site.